42 inch(fans stretching size-1080 mm). Below are the product details for Decorative Evolution Ceiling Fan. A retro style 5 blade fan with genuine high performance. Bigger robust body with unique cover dome complements heritage, traditional and fusion decors. 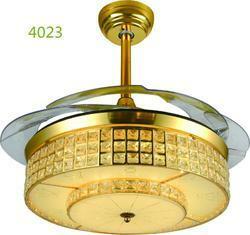 We have carved a niche amongst the most dominant names in this domain, engaged in offering Designer LED Ceiling Fan . We are recognized as the leading entity of optimum quality Modern LED Ceiling Fan.